There are a lot of good Korean dramas on Netflix. 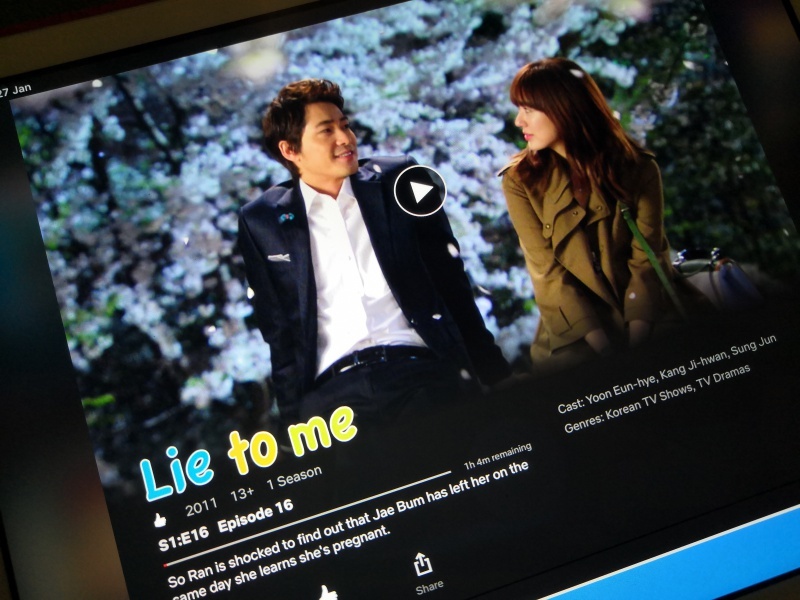 It’s a mix of the old and the new, with one of the older ones being a favorite of mine, which I had to re-watch as soon as I discovered that it was available: it’s the 2011 series called Lie to Me, starring Yoon Eun Hye and Kang Ji Hwan. The show is about Gong Ah Jung, who doesn’t want to be shown up by her friend Yoo So Ran, who married the man she was secretly pining for when she was still a student. In her desperation, she decides to lie and tell her that despite not ending up with Yoo So Ran’s husband she is happy and very much married herself. Through a series of unplanned events, a rumor starts that she is married to Hyun Ki Joon, the CEO of World Hotel. At first, he tries to threaten to sue her for the rumor but with the help of his brother, Gong Ah Jung ends up pretending to be his wife to help World Hotel land a big Chinese investor. As they pretend, the two eventually fall in love and this is when the complications start for the two. I’ve always loved watching Yoon Eun Hye in romantic comedies. It doesn’t matter who she is paired with, she always ends up being a good match to her leading man. She has this way of making her characters so likeable and endearing to the viewers, so you end up rooting for her even if you know she is making a big mistake. She’s such a good actress who you would laugh along with in her funny moments and cry along with in her dramatic ones. I wasn’t quite sure when I first watched the show if I would like Kang Ji Hwan because I felt that he looked too serious for the role, but he did hold his own with Yoon Eun Hye, especially with the funny moments which I wondered if he could do. The thing that I enjoy about Korean dramas is that the series is not too long. For this one there are only sixteen episodes, but they are packed with events that will satisfy the viewer enough to conclude the love story is played out well. Even with just that many episodes the story already includes side stories of supporting characters such as the love triangle between Gong Ah Jung’s father, his girlfriend, and the chef who is secretly in love with her. There is also the story of Yoo So Ran’s marriage. I prefer shows like this that don’t drag things too long just because they are rating well. It’s still about the story and the character development and not just to satisfy network ratings. I hope that Yoon Eun Hye’s next series, Love Alert (her first after a five-year hiatus), would also be released on Netflix. It’s been a while since I’ve seen her in a series and I can’t wait to see what she has for her fans next. If you’re looking for a quick binge watch of a Korean rom-com, you won’t regret watching Lie to Me. It’s funny, sweet, romantic and a feel-good show. I couldn’t help smiling while I binge-watched this. You need to catch it on Netflix while it’s still there!